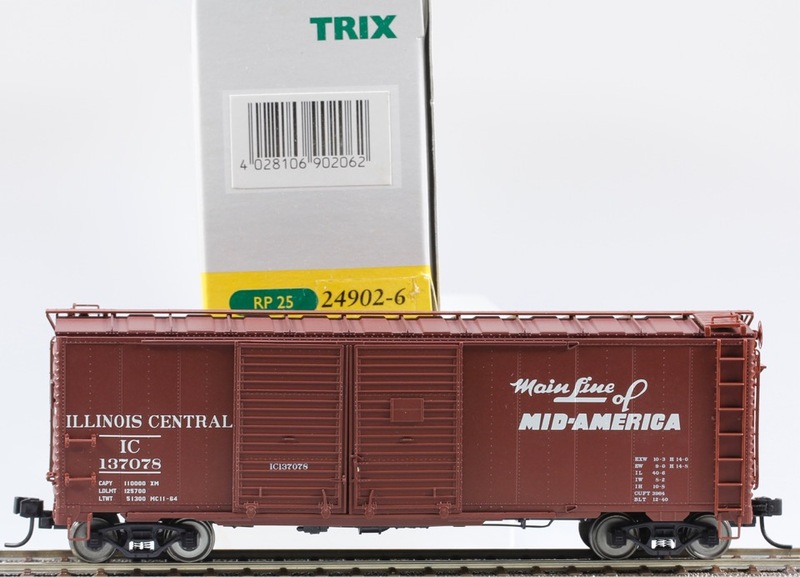 Marklin Trix H.O. #24902-6 Illinois Central Double Door Boxcar. The model has a plastic body, metal frame and metal floor. The detailed trucks have RP-25 wheel sets. The model has sliding doors that can be opened. The Roof walk, ladders and other details are separately applied. It has NEM coupler pockets that allow the couplers to be replaced with other types. Car length over the couplers is 15.5 cm / 6-1/8 inches. This Car is brand new and unused, in the original Trix box. This car was available from Marklin from 2002 to 2006.